Flying Eagle design, 1857-1858, with patterns dated 1856. Lincoln design, 1909 to date. Despite numerous public statements by various officials in the 1980s and 19908 to the effect that one-cent pieces have virtually no buying power on their own, it seems a certainty that these small coins will be with us for many years to come. The reason? They are needed to make change in transactions involving the pricing of goods at such figures as 99c, $1.78, etc., and, equally important, to pay state and local sales taxes. 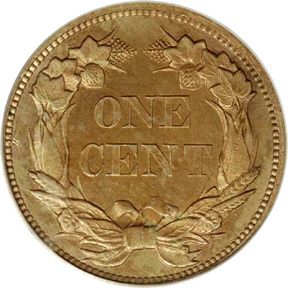 The reverse, with an "agricultural" wreath of corn, cotton, and tobacco, was borrowed from Longacre's own motif first used on gold dollars and $3 pieces of 1854. Between 600 and 700 patterns of the Flying Eagle design, bearing the date 1856, with the frosty or business-strike surface known today as Uncirculated or Mint State, were distributed to members of the Senate and House of Representatives, the Committee on Coinage (200 pieces), Weights and Measures, President Franklin Pierce (four coins), and various newspaper editors and others of influence, and additional pieces to persons associated with the Treasury Department. Exact production figures were never kept. In 1856, the coin hobby was beginning a rapid growth stage. 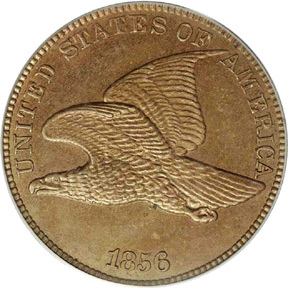 In 1857-1858, this accelerated rapidly, especially when it became known throughout America that the familiar old "large" cents would be called in, to be replaced by small Flying Eagle cents. A scramble to build sets of large cents ensued, and much attention was paid to such rare dates as 1793, 1799, and 1804. During this period, George Cogan, sometimes called the father of the rare coin trade in America, became the first full-time professional numismatist in the United States. The new, small Flying Eagle cents also became an object of admiration, not the circulation strikings, but the patterns dated 1856. The hundreds of specimens struck for distribution to congressmen and others began to have a premium value, and soon traded for 50c to $1 each. In absolute terms, this does not sound like a great deal of money. However, in the late 1850s it was equivalent to a day's pay for a laborer and, stated more spectacularly, was 50 to 100 times more than face value. Around the same time, the Mint was busily engaged in making rarities for collectors. In 1859, Director Snowden announced that he could supply scarce coins to numismatists who had Washington tokens and medals to trade for them. Snowden's favorite interest was tokens, medals, and other numismatic remembrances of our first president, and he spent a great deal of time and effort acquiring specimens for the Washington Cabinet section of the Mint Collection. on February 22, 1860, the Washington Cabinet was dedicated, and in 1861, Snowden's book, The Medallic memorials of Washington, was published in Philadelphia by J.B. Lippincott. Snowden was a learned man and an excellent numismatist, quite possibly the most numisma ... individual ever to hold the post of Mint director. In addition to whatever rarities Snowden may have made for trading purposes, it is likely that others, possibly the individuals Walter Breen has characterized as the "Midnight Minters," had access to dies and coining equipment at the Mint, and sought to feather their own nests (quite literally when it came to Flying Eagle cents!) by producing rarities for their own account. Whatever the unrecorded circumstances may have been, during the late 1850s and early 1860s, probably from about 1858 and continuing through the early years of the Civil War, many additional dies were made to coin 1856-dated Flying Eagle cents. At the time, it was felt by collectors that Proof was a better finish than Mint State. Thus, all of the restruck 1856 cents were made with Proof surfaces. Exactly how many Proof 1856 Flying Eagle cents were restruck is not known. Estimates have ranged from about 1,000 to 2,500. I believe that the truth may be around 1,500 to 2,000 coins. Today, Proof 1856 Flying Eagle cents are much more plentiful than are Mint State coins, the latter being originals from the distribution in 1856 to congressmen and others. Clouding the situation is the fact that certain Proof coins certified by grading services have been graded incorrectly as Mint State; thus, Population ReportSMs are of little help to the person seeking information. As time went on, the 1856 Flying Eagle cent became one of the most popular, most desired of all United States coins. Although it and its restrikes are not official issues, the design was not adopted until February 21, 1857, the 1856 has been "adopted" into the regular series. over the years it has been included in albums and listed in standard references, including the familiar red-covered volume, A Guide Book of U.S. Coins. Following passage of the coinage legislation on February 21, 1857, production of 1857 flying eagle cents commenced at a rapid rate. Eventually over 17 million were coined. A booth was set up in the yard of the Mint. Citizens could obtain the new Flying Eagle cents in bags of 500 pieces by exchanging Spanish and Mexican coins (made uncurrent by the new legislation) or large cents for them. From the outset, problems arose with striking the Flying Eagle design. Particularly affected were parts of the head and tail of the eagle, for these were opposite certain part of the wreath on the coin dies. During the striking process there was insufficient metal flow to fill the recesses in the head and tail of the eagle as well as the wreath at the same time. Among Flying Eagle cents, the famous 1856 is at once the most expensive and most rare. Nearly all unimpaired specimens are with Proof finish. True Mint State coins are great rarities; probably no more than 100 to 200 exist. Numerous circulated 1856 cents are in numismatic circles. These consist of original pieces that found their way into circulation, and were retrieved years later; and Proofs that were mishandled. The 1857 Flying Eagle cent, the first regular circulation issue, is fairly plentiful i most business strike grades, although above MS-63 it becomes elusive. Proof 1857 Flying Eagle cents are great rarities, and only a few dozen are known. An overdate, 1858/7, exists in the series. The upper right of the undertype 7 digit is seen protruding from the upper right of the 8, a feature that is lightly defined on some specimens. The last year of this ephemeral issue, 1858, is characterized by two varieties, the Large Letters and Small Letters. The difference in letter sizes is readily ascertainable if two examples are held side-by-side. As a quick method of identification, on the Large Letters variety, the letters AM of AMERICA touch at their bases, while on the Small Letters style, there is visible separation. Of the two varieties, the Small Letters is the scarcer. However, the marketplace has thus far made little distinction in price between them. Proofs of both the Large Letters and Small Letters 1858 Flying Eagle cents are very rare today, and probably fewer than 100 exist of each. As problems continued with the striking of the Flying Eagle cent, the Mint in 1858 turned its eyes toward a replacement design. Numerous patterns were made, some of which featured a very small or "skinny" eagle, an attempt to lessen the metal-flow problem that resulted in insufficient filling of die orifices in the regular issue. Quite likely, Longacre was disaffected with his Flying Eagle design, consisting as it did of a combination of older motifs. Further, in its time it does not seem to have been esteemed by the public; that is, the present writer has located no contemporary accolades concerning it in the popular press. For these reasons and possibly others as well, the Flying Eagle cent passed from the scene after 1858, with scarcely anyone to mourn the loss. Today, collectors recognize this as one of the shortest-lived of all major United States coin designs.